(CN) – Scientists have discovered vast deposits of water ice on Mars, prompting calls for future study and improving the chances of possible habitability of the Red Planet. Colin Dundas and a team of researchers with the U.S. Geological Survey announced their findings today, saying a number of ice deposits – some at depths as shallow as one or two meters below the planet’s surface – have been exposed by surface erosion. “The ice is a critical target for science and exploration,” Dundas said. The discovery of water on Mars, combined with geological evidence of ancient lakes, means the possibility of Mars supporting microbial life both in the past and present exists. Astrobiology missions are already scheduled for 2020 and beyond. But apart from tales of alien lifeforms existing on Earth’s neighbor, the discovery has implications for future geomorphological study as well. Much like Earth, where thick ice deposits provide lengthy climatic records, the ice discovered on Mars could provide a window into the climatological changes the planet has undergone over millennia. Furthermore, as entrepreneurial guru Elon Musk and President Donald Trump continue to talk about putting humans on Mars in the near future, the presence of water makes habitability more possible than if it had none. Dundas said the water ice deposits could potentially be used as a resource for further exploration of the planet. “The ice could be a useful source of water for future missions to Mars,” Dundas said. But more questions than answers abound at this point. 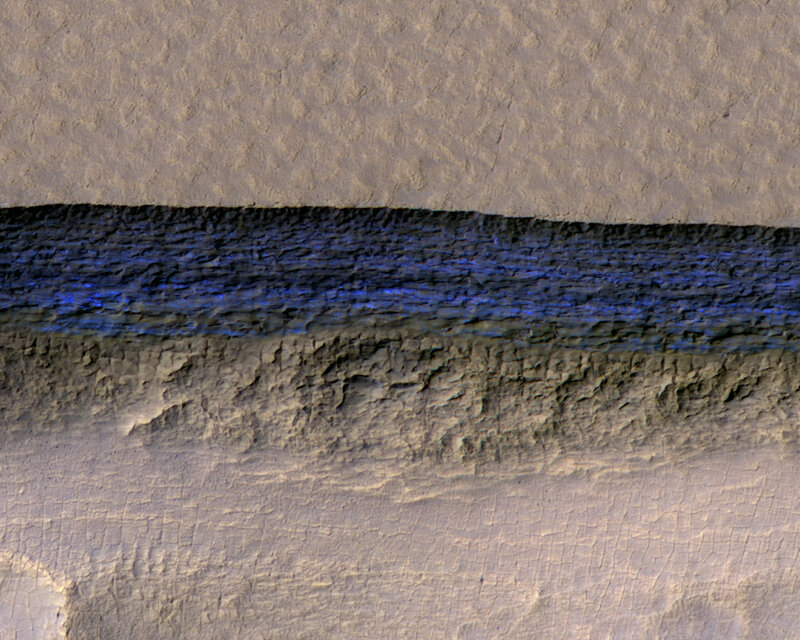 “Whilst water ice is known to be present in some locations on Mars, many questions remain about its layering, thickness, purity and extent,” Dundas said. Dundas and his colleagues used NASA’s Mars Reconnaissance Orbiter – a satellite that has circled Mars since 2006 providing scientists with a steady stream of photographs of the planet’s surface. The photographs show eight different locations where steep, pole-facing slopes created by erosion have exposed substantial amounts of ice persisting below the surface. “The fractures and steep angles show that the ice is cohesive and strong,” Dundas said. Furthermore, the appearance of variation in color in the photographs demonstrate distinct layers, which could be used to describe the planet’s climatic record. 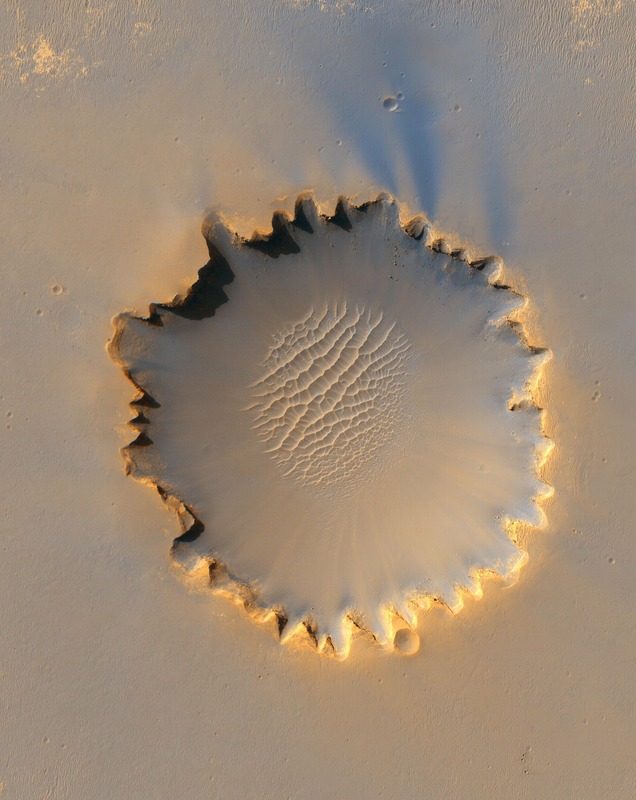 While there are some craters on Mars indicating the presence of past water bodies, there are relatively few, causing the scientists to hypothesize the ice formation occurred recently in geologic terms. “It is likely that ice near the surface is even more extensive than detected in this study,” Dundas said.